Rustic mason jar carved initials grandfather oak tree wedding invitations with a starry night sky background. 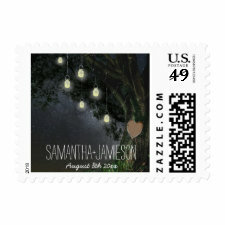 These oak tree wedding invitations feature a starry night sky background with mason jars dangling from branches. You can customize the carved heart initials to those of you very own. The entire collection is directly below and includes a wide variety of matching themed items — RSVP cards, wedding programs, favors and more. 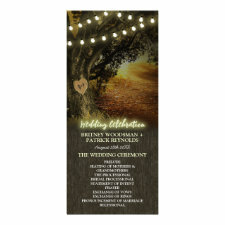 Country tree branch wedding invitations with lights. Fairy lights and a background of faint shooting stars make this unique invitation pop. Each invite features a tree branch wrapped in glowing lights. 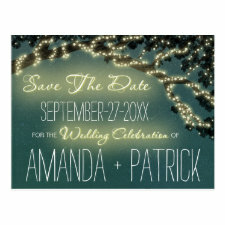 Wedding Celebration on both the wedding invite and RSVP set also give off a glow-like appearance. 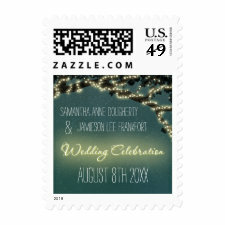 Include matching programs or add matching stamps to your envelopes for added design flare to your wedding stationery. Carved initials heart + grove of birch trees wedding invitations. These birch tree themed wedding invitations feature an elegant outdoor background. You can “carve” initials inside the heart. Invites are perfect for vintage, country or rustic weddings. The fonts used also feature fancy scripts for key text elements. You can fully customize the fonts if you would like. This design is fully customizable. Move text around, add information or whatever you would like. Country vintage mason jar oak tree wedding invitations with twinkle lights. 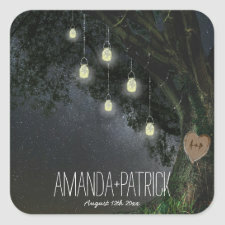 This design features a tree with hanging lights, and mason jars or lanterns that also contain lights. 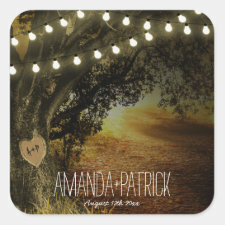 This design has a vintage background with oak leaves (part of the tree silhouette). Matching RSVP has the same matching design with more of a close up of the lights and jars — invite is in landscape design with the RSVP as portrait, as seen in the above picture. Perfect for farm/barn or any other type of country, rustic, or vintage wedding. Vintage old oak tree wedding invitations. 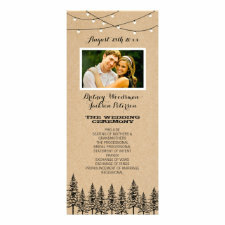 Fall string lights oak tree wedding invitations template set – features matching invites, RSVP cards, favors, wedding programs and more. Design features a realistic tree with a sunset or rising sun background. Decorative string lights dangle from the top branches. 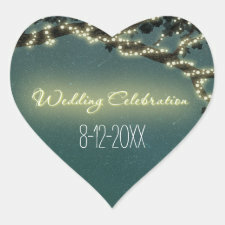 Wedding Celebration is also in glow matching text. 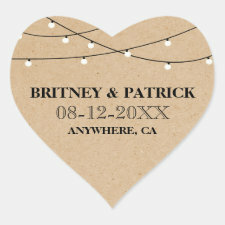 Like most other invites found on this page, this design also has a carved heart on the tree that you can customize. Perfect for fall, spring, or even summer weddings. Below are matching wedding programs, napkins and more. Spruce or pine tree wedding invitations with a kraft paper printed background with twinkle lights. Adirondack pine or spruce trees showcase this design with a kraft paper printed background. Lights hang from the top. 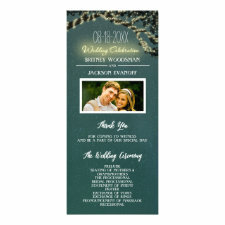 Use these invitations for campground, winter tree, woodland, mountain or evergreen themed weddings. They’re also perfect for Christmas weddings. Favors, custom photo templates for programs, and more are available below. Decorate water bottles, your envelopes and more with the favor stickers. 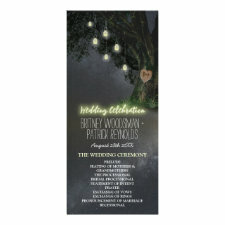 Firefly rustic forest tree wedding invitations – available in three colors. Choose from 3 different colors for your personal preference — gold vintage, enchanted purple or mysterious blue/green. 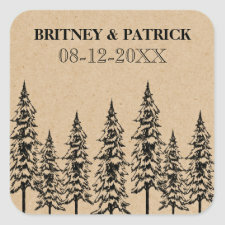 Each invitation features a forest theme with a tree silhouette. Grass and blades of wheat are at the bottom of the silhouette. A swirly rustic heart holds a plus sign dividing the bride and groom’s first names. Glowing lights or fireflies are peppered over the top branches, leaves and the top part of the trunk.